Hi guys! 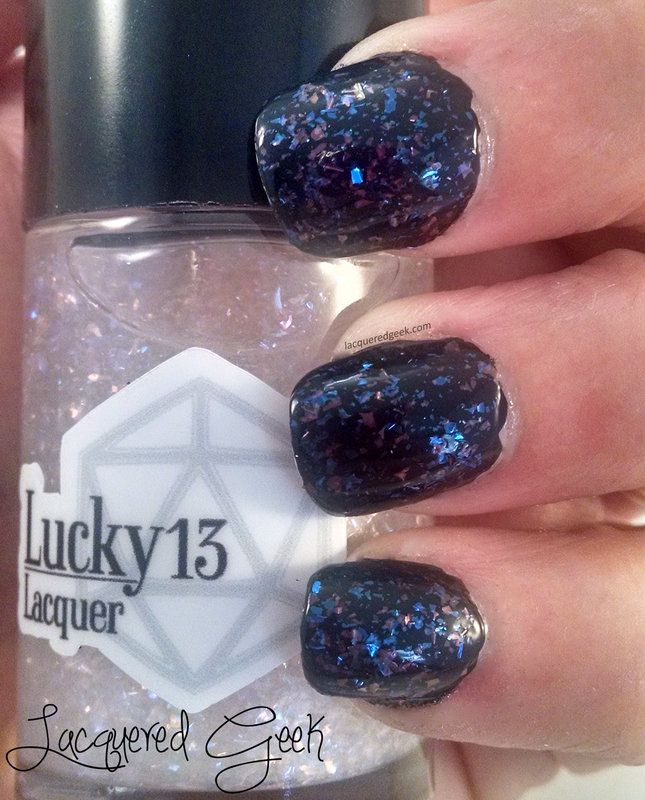 Today, I have the rest of the Out of This World collection from Lucky 13 Lacquer. If you remember, I showed you the first part of the collection here. 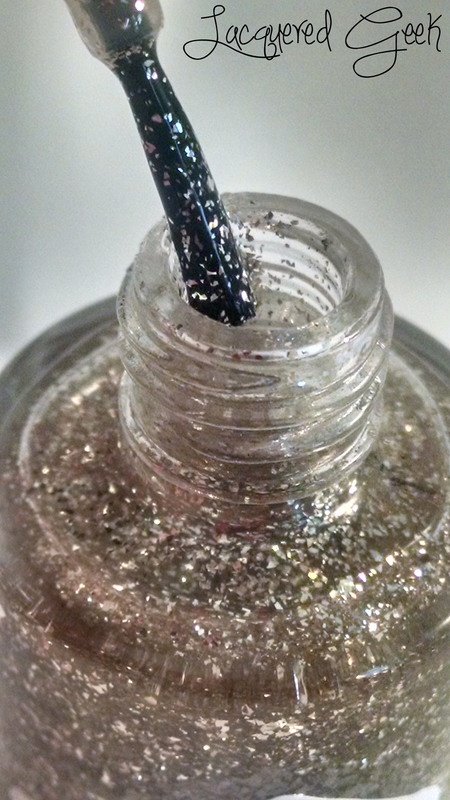 The part of the collection that I'm sharing with you today consists of the iridescent and silver flake polishes! 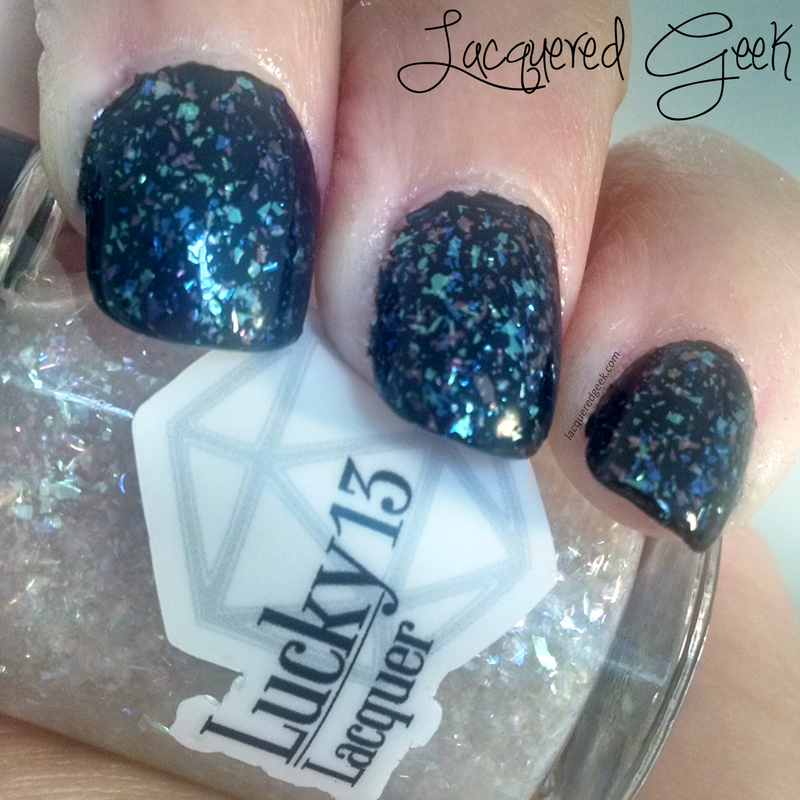 Since all of the iridescent flake polishes have a similar formula, I don't want to be a broken record when describing them, so I'll cover my thoughts about that at one time. They are all super densely packed. As a result of the sheer amount of flakes in the bottle, the formula is a little on the thicker side. 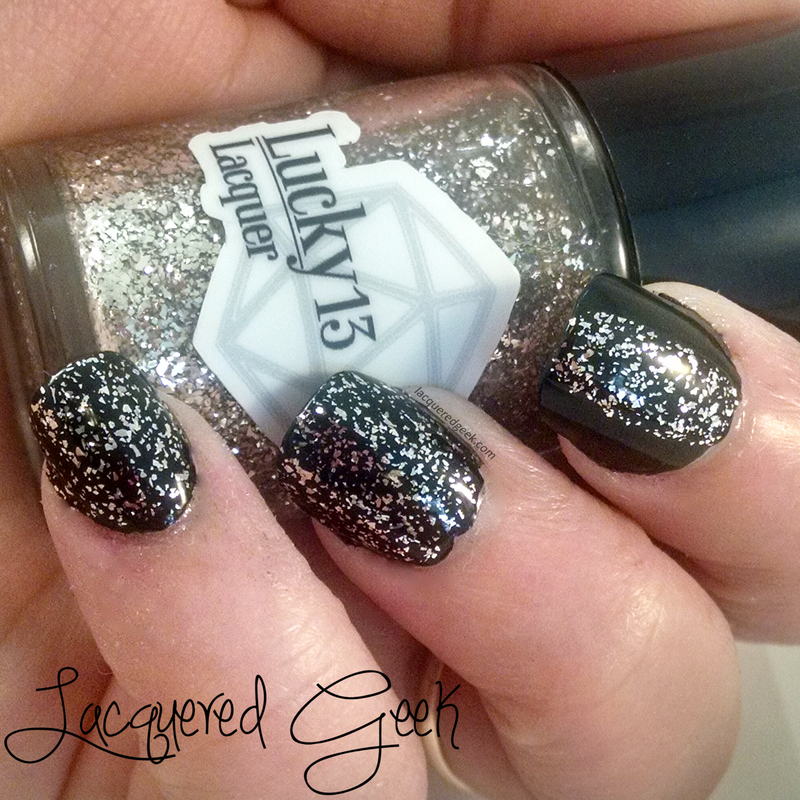 Trust me, you want a thicker formula to ensure all those flakes go on your nail just right! 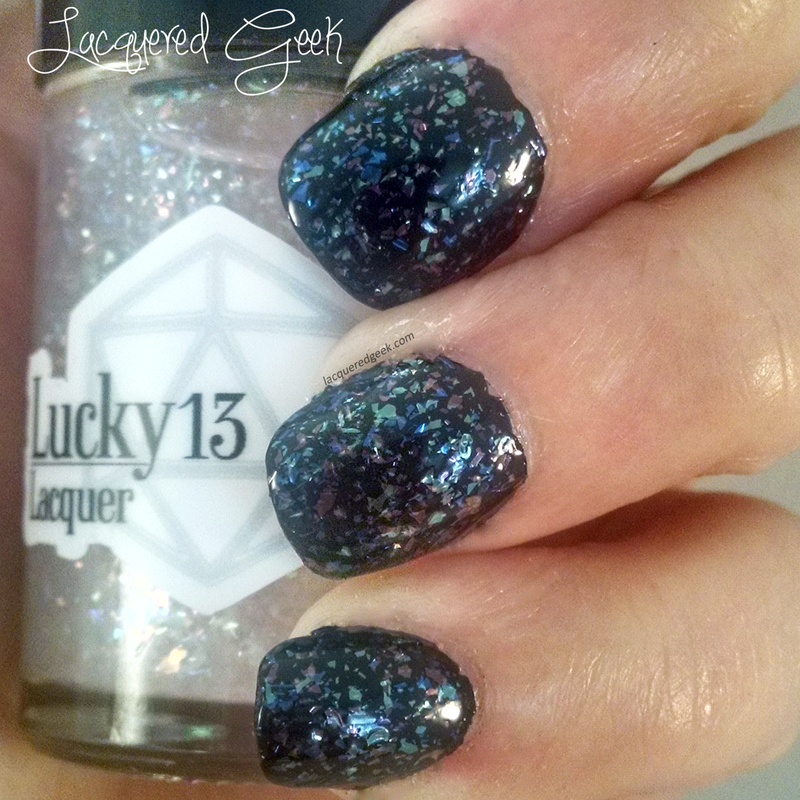 For each of these, I layered one coat of each topper over Dark Matter. 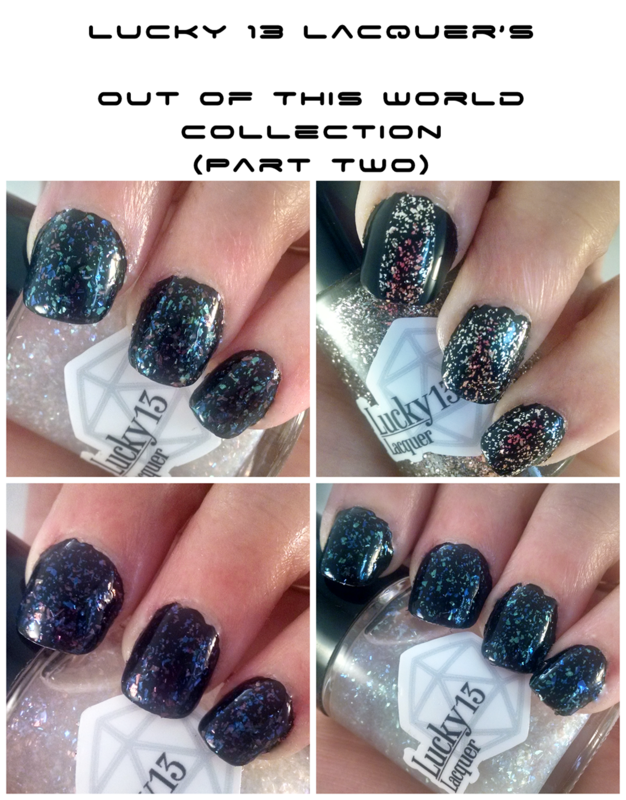 Although they may look alike in the bottles, they're completely different on your nails, and each is gorgeous! 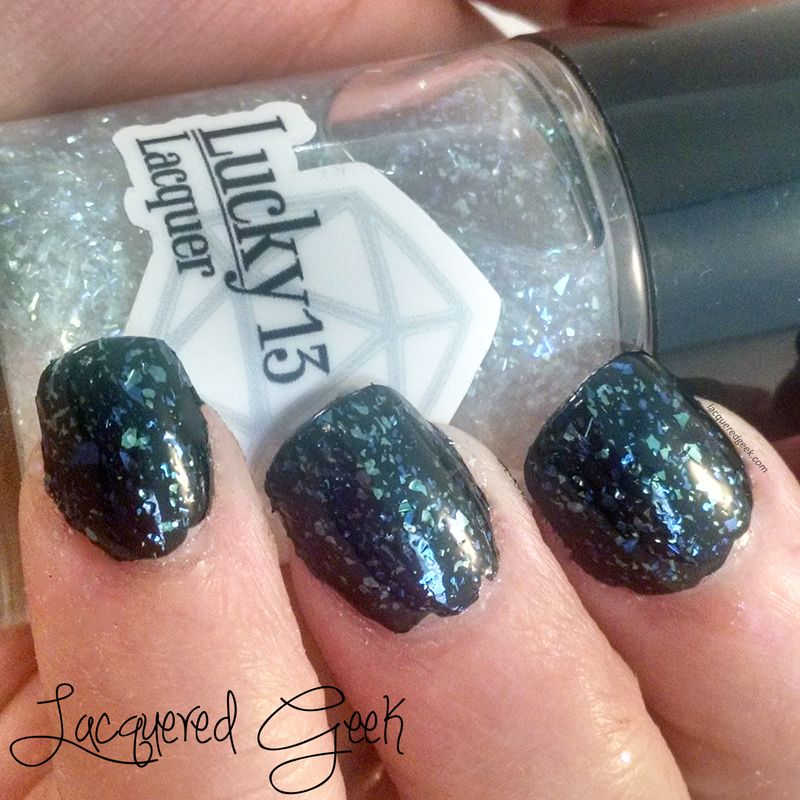 Gamma Burst is a dense mix of blue and green iridescent flakes in a clear base. 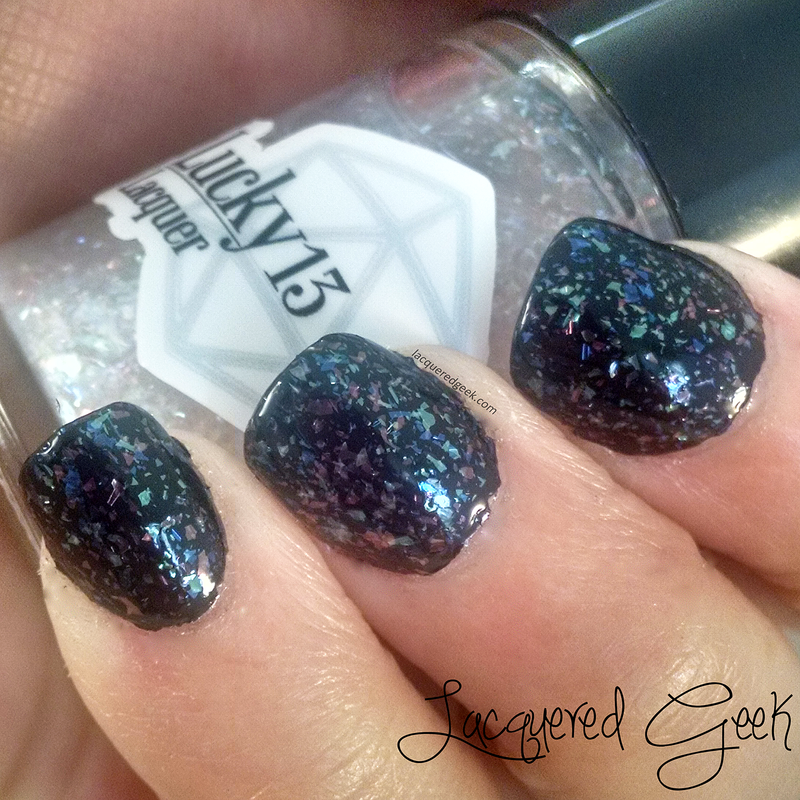 Neutron Star is a mix of pink and blue iridescent flakes in a clear base. 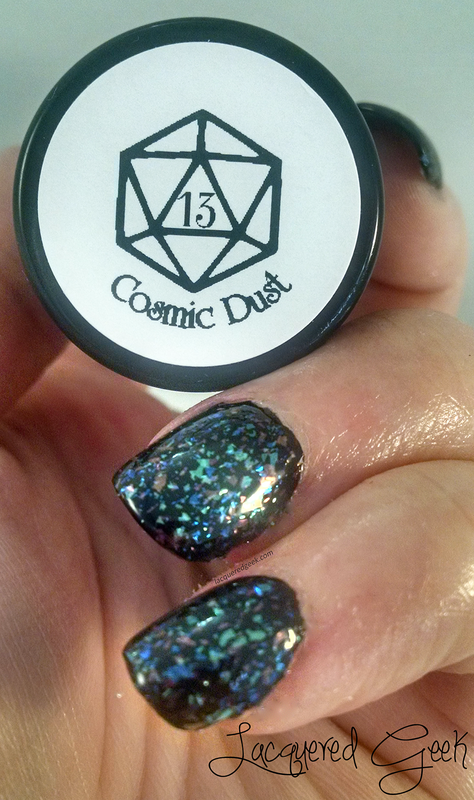 Cosmic Dust is my favorite of the iridescent polishes! (As if you couldn't tell by how many different photos that I'm going to show you) It is a mix of pink, orange, green, and blue flakes in a clear base. 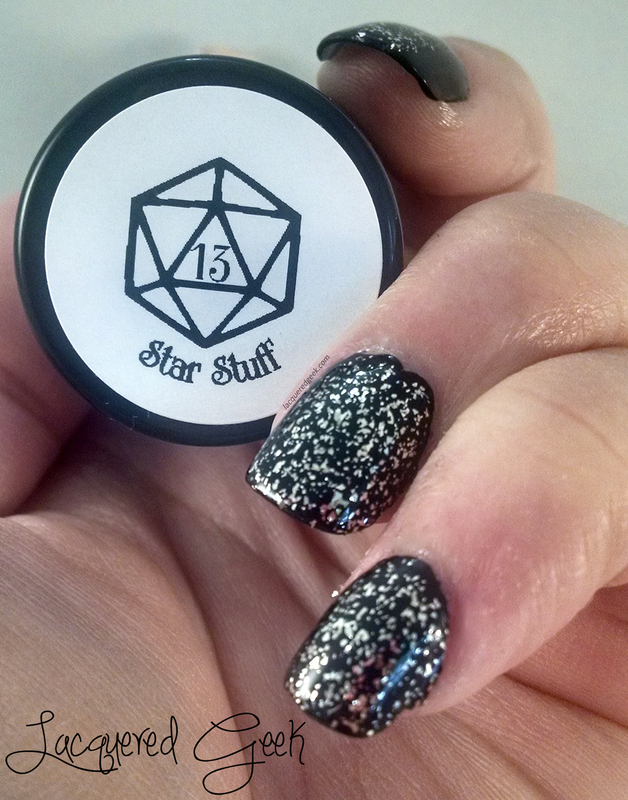 Star Stuff is genuine silver plated flakes in a clear base. Yes, I know it looks gold. But I swear, it's silver! I really love this one! I have only silver toppers in my collection, but all the ones that I can think of are just glitter. The flakes make this one super unique! 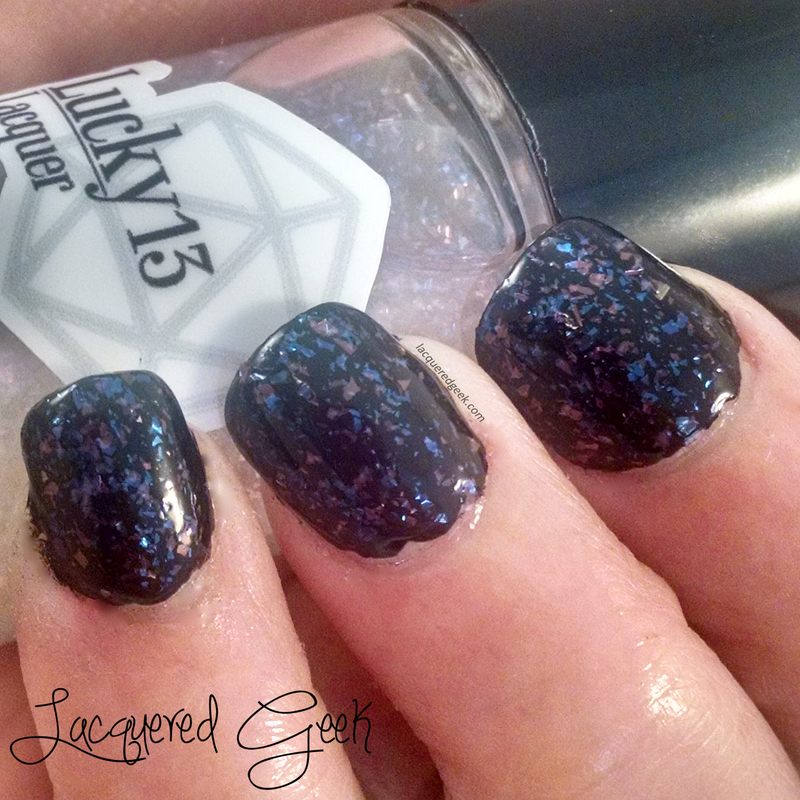 I wore one coat over Dark Matter, and did a little bit of dabbing around to fill in any sparse spots. Now to pick my favorites! I'm completely torn between Dark Matter, Aurora Borealis (showed in part one), Cosmic Dust, and Star Stuff! 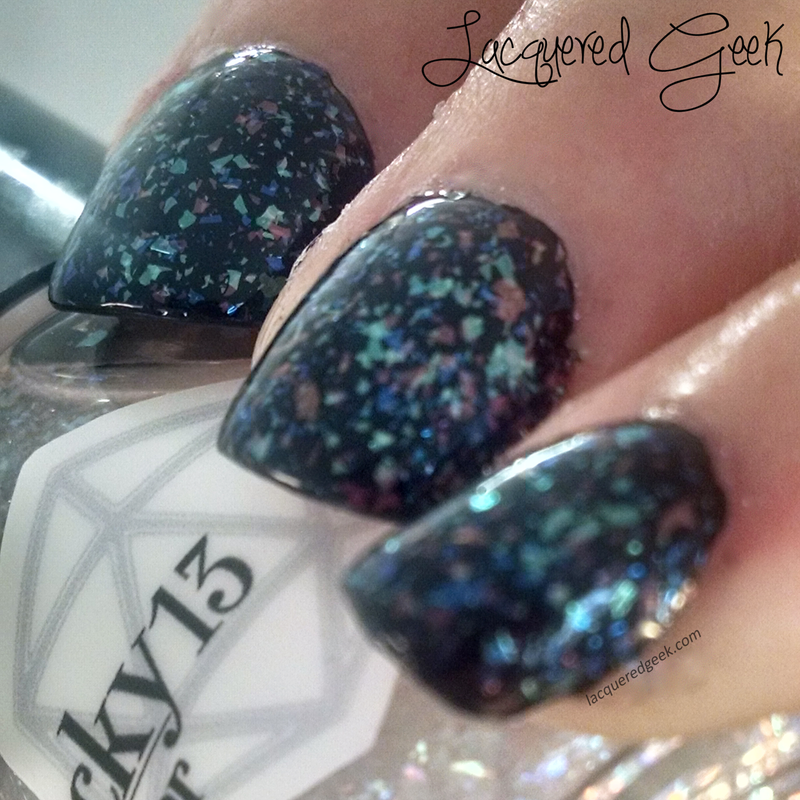 I just how unique the flake polishes are, and how well they each make such wonderful use of those gorgeous flakes! And seriously, who doesn't love a great one-coater! 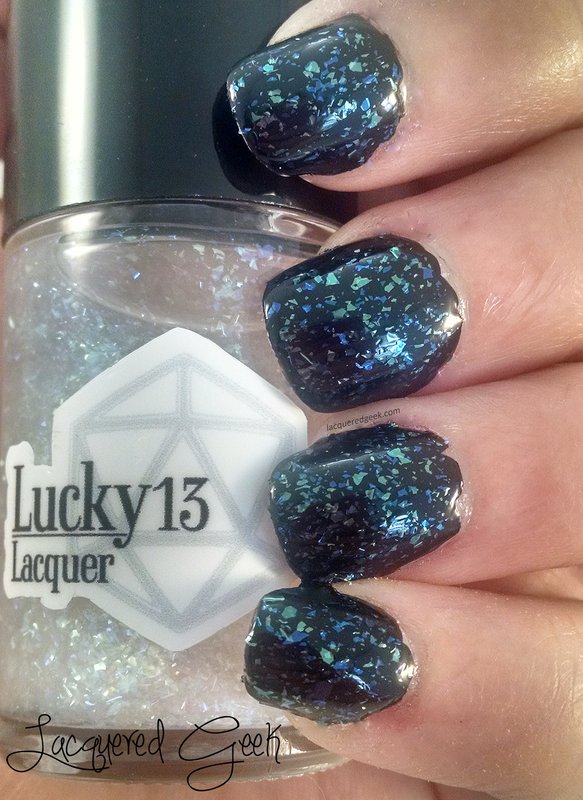 The Out of This World collection is now available at Lucky 13 Lacquer! 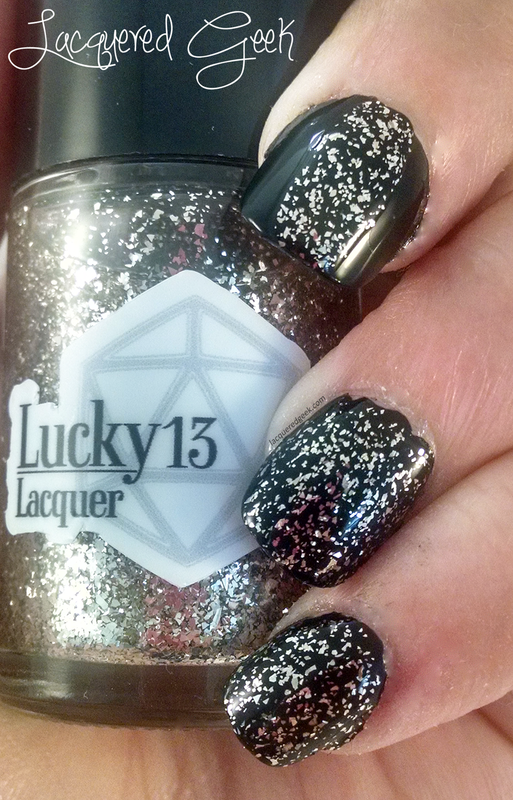 You can also follow the Lucky 13 Lacquer Facebook page to keep up to date on new collections that are coming out!